Choose your powers! Put on your mask! Fight the forces of evil and save the world! The Deluxe Hero`s Handbook is the revised and expanded core rulebook for Mutants & Masterminds Third Edition, offering everything players need to experience their own superheroic adventures. The detailed character creation system lets you make the hero you want to play, choosing from a wide range of skills, advantages, and power effects. Plus, customize your heros powers with modifiers to create an almost endless range of superhuman abilities. 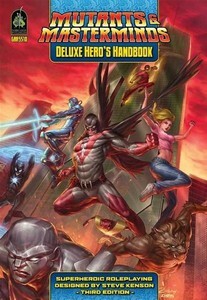 The Deluxe Hero`s Handbook also includes a Quickstart Character Generator and a new adventure set in Emerald City.